For the third year running the state of Tennessee has held the most officially sanctioned Global Entrepreneurship Week (GEW) events with 91. One of those events as part of Memphis’ GEW activities is the Amazing Risk scavenger hunt. A call was put out a month ago for startups to apply to compete in the Amazing Risk challenge. The field was narrowed down to three startups; Screw Pulp, Guild Local and the Memphis Urban Farm School. These three startups are competing for $10,000 in cash and prizes (services). The three startups began the day at Risk City Field Day in midtown Memphis. At 10:00am all three teams were given clues to what they had to do to earn up to 1100 points. At the end of the day the team with the most points will win the prize pot. The participants had to go to local eatery South Of Beale and pitch one of the waitresses. They also had to pitch Marvin Stockwell the Marketing Director at one of Memphis’ big social entrepreneur examples, the Church Health Center. Finally the last clue had the teams headed to the Memphis Civic Center downtown which is the collection of state, local and federal buildings. From there they needed to interrupt President Barack Obama appointed Federal Court Judge, John Fowlkes, and again give their pitch. Judge Fowlkes is no stranger to the Memphis entrepreneur community. His oldest son Andre Fowlkes is the Co-President of Launch Your City, the startup and entrepreneurial epicenter for Memphis Tennessee. While Judge Fowlkes was in on the contest, no one else in the courthouse was, which made the experience a bit challenging at first. Once each of the three startups arrived in the court room, jitters and nervousness went on extra high. It’s one thing to pitch a room from of entrepreneurs and startup leaders. It’s another to pitch a sitting Federal Court Judge, in open court. 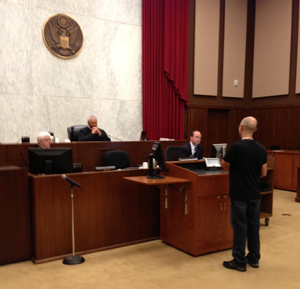 The first startup to arrive in Judge Fowlkes’ courtroom was, publishing alternative startup, Screw Pulp. Screw Pulp is a web platform that allows independent publishers to publish their books. Their book is originally given out free to a certain amount of readers who agree to review the book. After the first hundred copies are given away and reviews are accumulated ScrewPulp then begins to sell the book online in a more traditional manner. Wes the founder of Memphis Urban Farm School was next to pitch in the courtoom. Judge Fowlkes and his clerks had plenty of questions for Wes. Just before the judge’s lunch break the team from Guild Local arrived. They did a decent job of describing their startup but Judge Fowlkes still had questions. We’re pretty sure this is a first for any startup to have to go and pitch a judge, much less a Federal court judge. Later in the day we’ll find out which team won the most points in the Risk City, Amazing Risk Challenge. You want to come to this right?